Recently i visited the UK to host a Grey Seal and Red Deer photography workshop wich was great fun and left me with a couple of decent shots of both species. The Grey Seals are the largest colony in Europe and in wintertime they give birth to their pups. This all starts around mid november and the Seals stay untill end of January when they head back out to sea. The Red Deer are still reasonably active in november as they have just finished the rut. This years Grey Seal and Red deer photography workshops are allmost fully booked and if you would like to join me this november or december (see details on the www.jeroenstel.com website) then be quick as first one to register is the one to join us on the trip. First i apologize for my english but i don't speak your language. 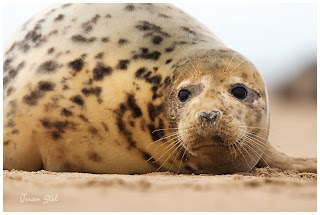 I am a french photographer and i was searching for find a seal colony near France and i find your blog. Do you know a seal colony in netherland ? it's not difficult to approach ? And thank you for your blog ! you have a lot of good photographs. 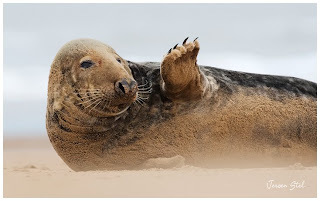 These Seal photographs where all shot in the UK on the eastcoast where they are quite easy to approach. In Holland we do have some Seals showing up near the Brouwersdam sometimes and we have some small Seal colonies neat the Dutch isles.